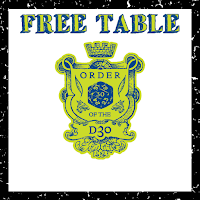 September's d30 Table is up! I've largely taken the month of August off to attend to some rather pressing personal issues, but I think I've gotten to the point where I can resume some more writing & creating. I've managed to keep up with the Free GM Resources on Mondays and a Frugal GM Review on Saturdays, but everything else was put on hold. This month's table is a quick tavern generator that quickly establishes the size of a tavern, how busy it is at the moment, and the tavern's name. Coupled with a food & drink generator (not a d30 table, but still.....) and you should be relatively good-to-go. 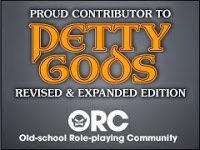 Like always, click on either graphic in this post, or use this link.